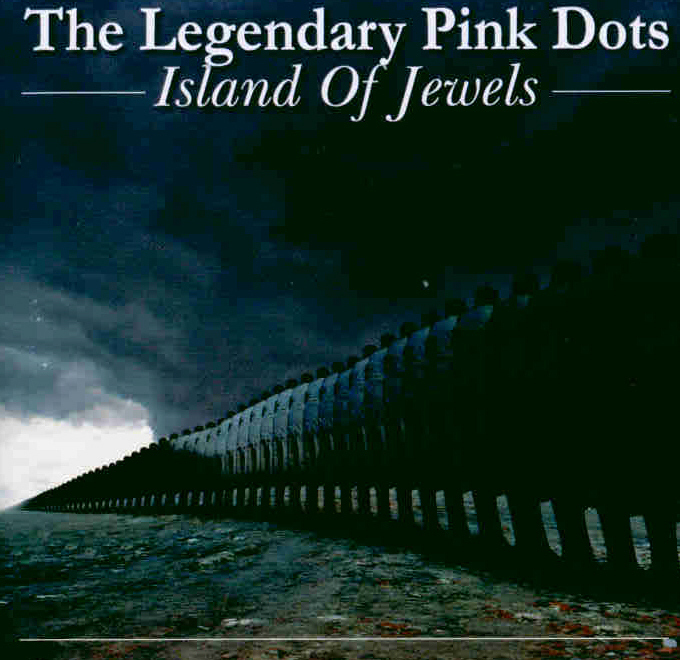 The Legendary Pink Dots, "Island of Jewels"
The first 5000 copies of the P.I.A.S. LP edition and all copies of the Penguin edition have a gatefold sleeve with printed lyrics. My union's name is Jack, and it's a ripper! hammers her head with a sickle, nails monkey to the tree. The lasers, they beam from the stars and Moscow is charred. Peking is leaking. Tripoli's stripped (ha! ha!) - Mohammed, he flees from his mountain, counting the corpses in the stadiums with his shades on cos the white light hurts his eyes. And Captain, he cries, Captain, he screams, falls out of bed. It's only a dream (?) Nightnurse wipes his forehead, whispers "try to sleep... back to sleep..."
Peeling paint, dead cigarettes... old cobwebs on the ceiling. Feeling faint, the spider fled - the flies played hide 'n' seek. We wrestled cheek to cheek, pink naked on the sheets. A feel was cheap, a deeper thrill was steeper. Camera peeped, director leaping, screaming, shouting, louder "Roll 'em, hold 'em, hole 'em, Close up. ART! Prepetual motion. Higher! Ram it home now cowby. Down Boy. Showdown! 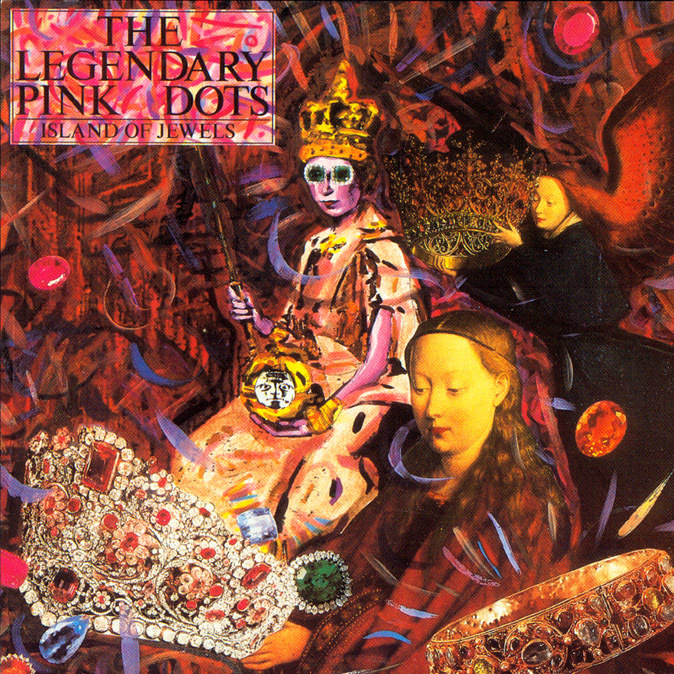 Shoot that crazy foam across the duvet..." Get them creaming at the dairy, pumping lonesome 'cross the Praries. Hats spin on their laps. The hotsprings gushing. Play roulette. The russians do it best - well, don't they, Jerkov? Bills were mailed express, black borders ordered PAY. Across the page the figures were laying and laughing... Jenny ripped them up. She ran the bath. Called her daughter, told her "Count to three, then throw the toaster - Mummy's ghost will watch you from a better place. Be brave!" She braced herself but plugs were pulled. No power, so she crawled into the kitchen, tried the oven. Slipped her head in sideways, raised a hand, switched on the gas... No hiss, alas! She snapped. She snatched the safety razor, slid it across her wrist. She snapped a dozen plastic knives. She tried a dive through double glazing. Taps kept dripping. Rats were running. Vermin squirming in their holes, the neighbors banging on the walls. Outside the sirens were blaring. Babies screamed. The jailer was staring at her nakedness; smiled from the mirror with a key tied on a string. She can't get out, he won't come in... Round and round we go. Her tower. MY TOWER! In Cut Throat Lane the chains were swinging. Iron boots with blades on springs were lancing. Silver dance. The ghetto ballerinas tiptoed, blasting. Rattlesnake Arena burning red black red black. The gutter snipeser gasped beneath their melting mask's that kept on smiling. Dead eyed. Dog's Breath. Choke! Rattlesnake Arena burning red black red black. The stakes were low, the winner takes a wall to lean on, scrawl his name on for a night. The story starts again. Astrid, do you recall the Sundays at the Spa with double straws from a carton with a heart on. Who could ask for more? You'd assure me you'd support me as I tried to write that novel in the hovel we called home (OUR home). You'd mow the lawn you'd pay the bills. You touched me there. The Shock of Contact kept us warm. And Astrid, you kept your word, you never said a word, as I ripped up the pages, spent your wages, entertaining friends you hated, making bombs and planting them in galleries. Your salary was wasted (oh how criminal)... They cut the power, they pulled the plugs - they took away the phone. We're quite alone. We share a candle in the cellar - oooh you touched me there. The shock of contact kept us warm. And Astrid, as sure as blue skies always turn to grey - they came with guns. I tried to run and you took all the blame. They took you and I never said a word - and now you never say a word as I lean through the bars. I whisper my apologies, oh Jezus you stare clean through me. You cut me down, I touch you there.. The shock of contact keeps me warm. Our lady on the wall selling poppies for Our Boys. Our price. Our choice. we bought one-watched Our Lady fly confetti fly the city die in flames as tanks spat amber at the Odeon. A soldier on the podium. One leg, a face that's splashed with egg... a roadmap stained by cherry brandy, cracking jokes about The Jerry. And we snatched his helmet, pissed and blew our whistles with the steam. The kettle boiling, so we stamped and screamed for China tea. Were playing Shanghai in the cloisters, sucking oysters, dipping fingers, finding pearls the size of avadado pears. The treasure's there - a shame there's nowhere left to spend it... Shall we share the powdered milk and wait for God? Our lady in the abbatoir. She's hanging headless, charred. Baby on her breast - there's nothing left, the milk turned to powder, Twist her, she's an hour glass - but time has died. The blast was final. Captain's flat down in the urinal fixing cos he's sick of shooting shadows. With supple hands and iron will, we'll shape the land - we shall rebuild. We'll make the world a garden - we'll only scatter seed. We'll turn the weeds to wine. We'll count to nine whenever we are angry. We'll see our kingdom come. We're the Guardians of Eden.